Drink: Get Real in 2012 | CookDrinkFeast! I owe a lot of what I know about wine to my wine club. 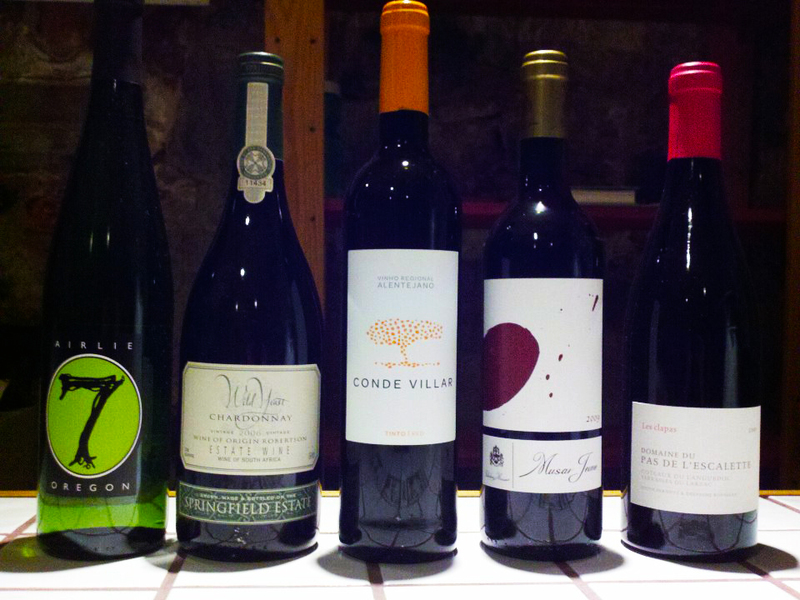 Every month, we select a new, relaxed venue for a tasting and to learn about new wines. This month’s tasting was held at the Wine Underground a great local wine store that holds tastings in their fantastic underground wine cave. 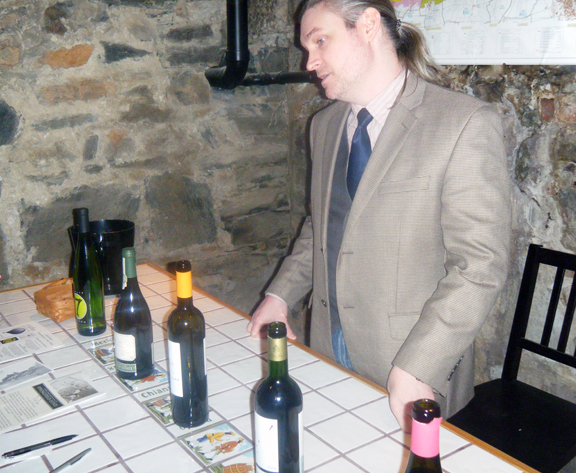 Armin, Wine Underground’s manager, gives informative lectures. The theme “Get Real in 2012” was based on Armin’s response to the drinks business‘s article about manipulated wine. This white blend has citrus, floral, and honey on the nose. The palate has citrus with some notes of spice. Pair this easy drinking wine with salmon or a bitter green salad. This South African Chardonnay is fermented with natural airborne yeast – which is the traditional old school style. There is a mild sweetness on the nose. The palate has tropical fruit with some minerality, earth, and a hint of a hard cheese, like pecorino in the finish. I enjoyed this wine. However not everyone was a fan. Overheard: “I need to eat some cheese to get the taste out of my mouth.” Pair this complex wine with roast chicken or pork dishes. Armin described the color as “electric magenta.” Conde Villar is one winery in Portugal that does not make port. This light-bodied red has raisins on the nose. It tastes of cherries, blackberries, tobacco, and a spicy earthiness with a hint of menthol in the finish. Some Bad Girls compared this wine to Pinot Noir. Pairing suggestions by the Bad Girls: roast chicken with a plum sauce, herbed roast pork tenderloin, ‘kitchen sink’ salad with bleu cheese, or just by itself. I had never heard of Lebanese wine before. I don’t know why since this region is the cradle of winemaking. The Hochar (pronounced Hoshar) family moved from France to Lebanon in the 12th century and has remained there ever since. Read more about the fascinating history of Chateau Musar when you have a moment. Only after you’ve finished reading my blog. On to the wine – Serge Hochar leaves the barrels under filled to allow the wine to slightly oxidize. Usually oxidized wine is bad. But in this case Serge controls the amount of oxygen that comes in contact with the wine. Armin says that this wine is meant to be an expression of the grapes that they use and the terroir. The 2009 Musar Jeune Rouge is deep purple in the glass. It was a little too cold when Armin first poured it and had notes of leather on the nose. However, after warming up in the glass the leather faded into notes of blackberry and vanilla. I see this fruit forward red pairing nicely with roast pork or beef tenderloin. This red wine has a nose that one politely refers to as “barnyard.” It reminds me a bit of a horse pasture with the scent of wet earth and hay. Some of the wine club members refer to it as a “poo wine” – which isn’t a bad thing. The barnyard funk gives way to some baking spices. The palate has notes of plum, blackberry, and cassis. This was my favorite of the five. I would serve this with braised lamb. Wine Underground has an eclectic cheese selection. The square cheese in the front is a Der Alpen Kase made by Pennsylvania Dutch cheese maker John Esh. He has a line of cheeses called Goot Essa. This cheese tasted like a combination of a sharp cheddar and a Swiss. 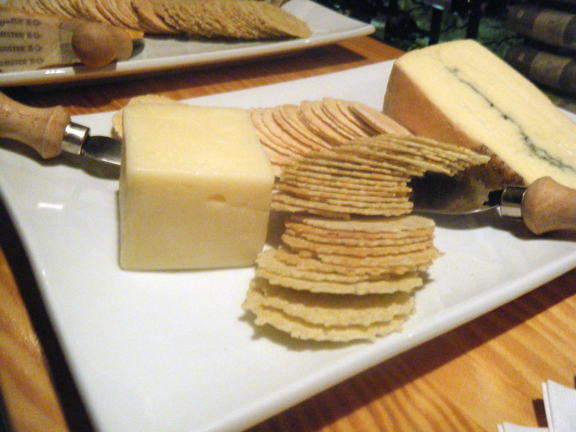 The wedge with the vein is Montboissie du Haut Livradois Morbier. This semi-soft cheese has a nutty flavor. The vein is a thin layer of vegetable ash. 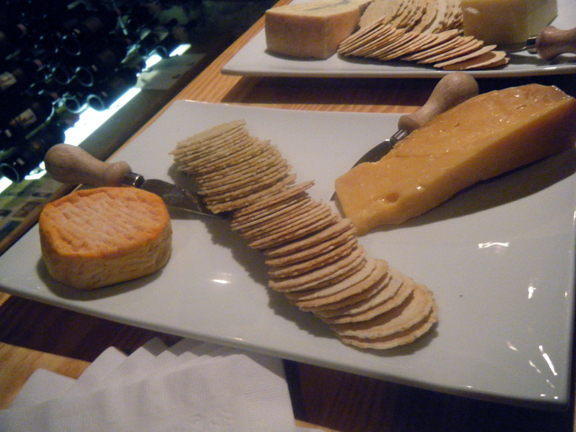 The round cheese on this plate is ColoRouge by Mou Co – a triple cream washed rind cheese. It was a creamy and delicious. In describing this cheese, I am tempted to use clichés like ‘sinful’ and ‘decadent’. The wedge is Beemster XO – a Gouda that has been aged 26 months. It has a malty yet mellow flavor. As usual – I had a great time. Armin is both knowledgeable and entertaining when he gives a wine lecture. I learned a lot and had some delicious wine and cheese. I’d say that was a productive afternoon. Next month we are going to do an exotic wine tasting followed with pole dancing. I can’t wait!